What is your favorite season? Random question, I know. I would have to say mine is Fall and I have to admit that I got a little "Fall sick" today (It only lasted for about 30 seconds, then I was over it), but I was looking through my candles, trying to decide what scent I wanted to use today and I saw all my Fall time scents - vanilla acorn, pumpkin pie, baked apple pie, spiced orange harvest, etc . . .
Fall is such a cozy time of year. I love anything and everything pumpkin - muffins, cookies, scones, cornbread, etc . . . , I love soups and chilis and I love when the weather is starting to get cool enough for a jacket or when it's cold enough to curl up on the couch with a blanket. Don't get me wrong, I sure do love having a nice suntan in the Summertime and I love wearing my flip flops everywhere I go, but there is just something about the Fall time? I might just have to give in and make something with pumpkin. Anyway, Banana Cream Pie is my all time favorite pie - no questions asked and Cake with frosting is my all time favorite dessert. Combine the two together and it is a match made in heaven! These cupcakes are delicious. 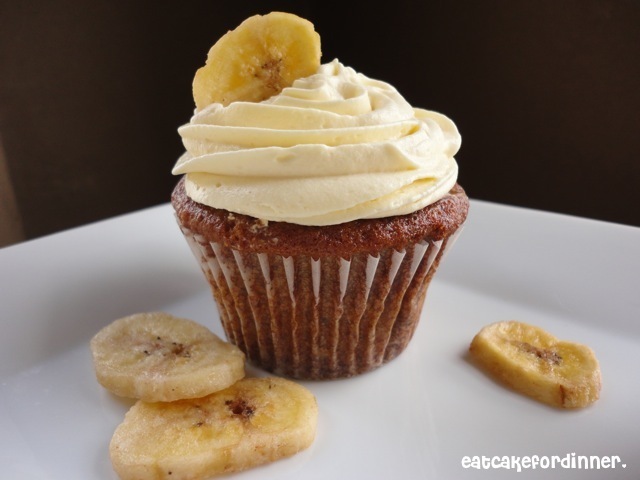 The cupcake has the perfect balanced banana flavor with a yummy banana pudding filling and the frosting is light and creamy and very vanilla-y and almost tastes like vanilla ice cream! These would be a huge hit with any banana fan! -Combine all ingredients until smooth. Refrigerate at least 30 minutes before using. -Mix vanilla pudding with milk and vanilla. Whisk in the powdered sugar. Fold in the cream until no streaks remain. Refrigerate at least 30 minutes before using. For Cupcakes: Pre-make filling and frosting. They both need to be refrigerated for at least 30 minutes. Preheat oven to 375 degrees. Whisk together flour, baking soda, cinnamon and salt; set aside. In mixer, cream butter with sugars until light. Add eggs, one at a time, then vanilla. Add flour mixture alternating with mashed bananas and yogurt or sour cream. Mix on low until just moistened. Batter may be lumpy - do not over mix. Bake 17-20 minutes. Remove to rack and cool completely. When cool, take a paring knife and cut a small circle out of the top middle of each cupcake. Fill with banana filling. Top with vanilla frosting. Garnish with crushed graham crackers and bananas, if desired. Keep refrigerated. Yield: 24-28 cupcakes. Jenn's Notes: I am still eating these cupcakes (3 days later) and they are still amazing, if not, even better? I really really like them. I cut the cupcake recipe in half and got 13 cupcakes. I made the entire frosting recipe and had just enough to pipe onto each cupcake. The frosting pipes beautifully after it has been refrigerated (I even used Light Cool Whip). So, if you are going to pipe a pretty swirl on each cupcake, you will probably want to double the frosting recipe. Mine were done at 17 minutes. They got very dark brown, but they do not taste burned, but be careful not to overbake! I love fall, but I hate that it means that winter is just around the corner. These cupcakes look so good!! Your singing my tune sister! Fall is absolutely my fav! Pumpkins pumpkins and more pumpkins! Is it here yet?!!! I had the most amazing banana cream pie in Hawaii eight years ago and I'm still trying to find something remotely similar to it here in the Continental. These cupcakes remind me of that pie. YUM!! Thanks so much for linking to Thrifty Thursday! These look pretty and delicious. It is worth the extra effort to add the swirl. I have no eye for this and usually bake plain cupcakes. Would you link these beauties to Bake with Bizzy? Oh my do these look out of this world! Please share your recipe by linking it up at Muffin (and Cupake) Monday. Our readers will love it! Thanks! i love your blog! everything looks so delicious!! Oh, Fall...how I love thee. And I love your beautiful cupcakes, yum!! Mmm, while I love summer, these make me pine for crisp autumn air. Thanks so much for sharing on Friday Food at Momtrends. I love all this kitchen inspiration. These look so yummy! I copied down the recipe so I could make them. Great pictures! Absolute heaven! 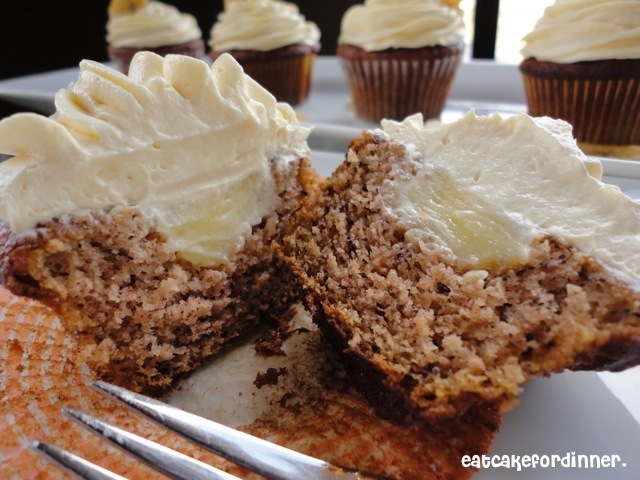 My daughter and my favorite pie is banana cream and these cupcakes look like a perfect translation into cake form! Oh my! I'm definitely going to be making these. My family and I love banana anything! Thanks for sharing. It's so funny to read what you wrote about fall. Only a few hours ago I was talking to my husband about how I was looking forward to fall, and that I was tired of all the heat. He looked at me like I was crazy. But I do love the season and it can't get here soon enough for me!! I love the banana cream pie cupcakes recipe. I have a lot of bananas in my freezer, and I need to use them. I'll be making this over the weekend. Thanks!! Everything about these looks and sounds delicious from the filling to the fluffy frosting. I've got to try that frosting. I love the idea of using the pudding mix. And, with the banana cream, too...what a winner! Thanks for sharing on A Well-Seasoned Life's Sweet Indulgences Sunday. Fall is my favorite too, love the crispness of everything! 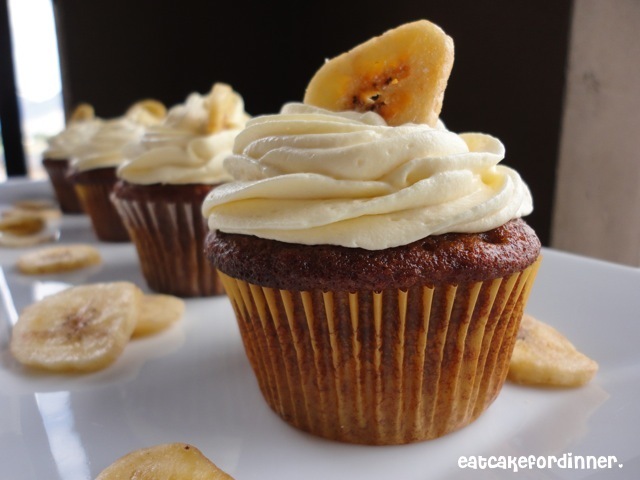 The cupcakes look delicious, and I know my husband would love them...he's got a thing for banana anything. :-) Thanks for linking up! These sound/look amazing! I LOVE fall too! Jenn - seriously - you are amazing!! You seriously need to go on that show Cupcake Wars!! Everything you make is so beautiful!! Thank you so much for linking up this week at Saturday Social! More yummy cakes! These ones look lovely and moist! This looks completely divine! Yummy, wish I had one now to eat! What I wouldn't give to bite into one of those. Thanks for linking it up to Sweets for a Saturday. These cupcakes sound wonderful! I need to try them out! You might think they taste better tomorrow? Hopefully everyone else likes them. Thanks.